Our eyes are our windows to the world, but too often we take them for granted. Regular eye testing is about much more than measuring how well you can see. It gives us a valuable insight into the condition of your eyes and your overall health, and helps us spot and treat any eye conditions. It’s important to have regular eye examinations as part of your general healthcare routine. At Leightons we recommend an eye test at least every one or two years, as specified by your optometrist. Children should also have regular eyesight tests, so that we can catch any vision-related problems early on. If you notice any changes in your vision or you’re worried about your eyesight, you should book an eye test as soon as you can. Can I get a free eye test? We offer free NHS eyesight tests to anyone who is eligible. This includes those aged over 60 or under 16 (or 18 and under and in full-time education). There’s more information on who’s eligible for a free eye test on the NHS website. As part of your Leightons eye examination, our friendly and experienced optometrists will give you a full eye health check. This includes checking your vision and deciding if you need any correction, such as glasses or contact lenses. You’ll be tested for common eye problems such as cataracts and glaucoma, and we can also identify risks of other health conditions such as diabetes and high blood pressure, in which case you may be advised to speak to your GP. What kind of eye examinations are available? At Leightons we offer three types of eye testing for you to choose. 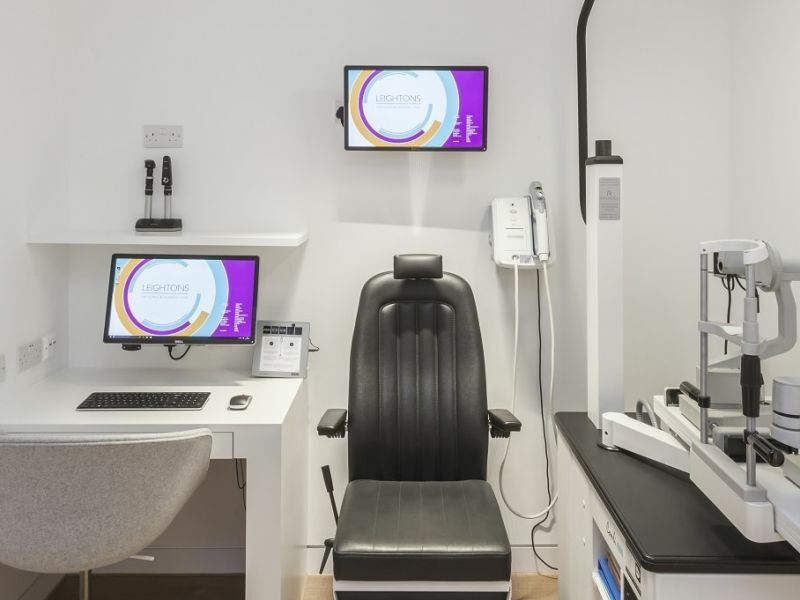 The Leightons Eye Examination is a thorough eye exam that can include digital retinal photography, useful for spotting the early signs of different eye conditions. The Leightons Ultimate Eye Examination includes an OCT scan as well as retinal photography. The OCT test shows the eye tissue behind the retina, and allows us to detect serious eye conditions up to five years earlier than standard testing. The Leightons Advanced Eye Examination is available in selected branches, and includes Optomap imaging as well as OCT scans and retinal photography. Optomap imaging is an advanced technology which allows us to take panoramic images of your retina. Eyesight loss can affect anyone, although conditions such as age-related macular degeneration, which affects our central vision, can develop as we get older. Other common types of vision problems include myopia (short-sightedness), hyperopia (long-sightedness) and presbyopia (ageing of the eyes affecting reading focus), as well as eye conditions such as cataracts and glaucoma. Whatever your eyesight issue, our Leightons optometrists will offer you support and advice so you can find the treatment option that works for you. What kind of glasses are available? At Leightons we offer a huge range of glasses, so it’s easy to find a shape and colour that suits your style. We can also help you adjust your glasses to fit your lifestyle. If you’re a sporty type or love the outdoors, a UV coating will help shield your eyes from the sun. If you spend a lot of time working at a computer, an anti-reflective coating can help cut down irritating glare. How can I tell if contact lenses are best for me? With today’s advanced technology, lenses are both comfortable and convenient. Our optometrists can talk you through our wide range of cutting-edge lenses to help you decide which kind are best for you – from daily disposable lenses to multifocals. Can I trial my contact lenses? At Leightons we offer a free trial of all our contact lenses, so you can test different types and find the best for you. Once you’ve decided on your ideal lenses, we’ll make sure you know the best eye care practices for your contact lenses. We’ll also carry on helping you take care of your eye health and comfort, with our Leightons Care Plan, which includes unlimited contact lens checks and a full yearly assessment. It’s vital to have regular eyesight tests. It’s the best way to make sure your eyes are healthy and that your prescription for any glasses or contact lenses is accurate. Between check-ups, you can also do your eyes a favour by taking regular breaks from computer and mobile device screens, and by wearing sunglasses in sunny weather to protect yourself from UV rays. Enjoying a balanced diet and not drinking too much alcohol will also help you keep your eyes healthy. [Read more about changes you can make for healthier eyes here] (https://leightons.co.uk/blog/eye-care/world-health-day-healthier-eyes/). Book any eye examination today: call us on 0800 40 20 20, visit our website, or pop into your local branch.